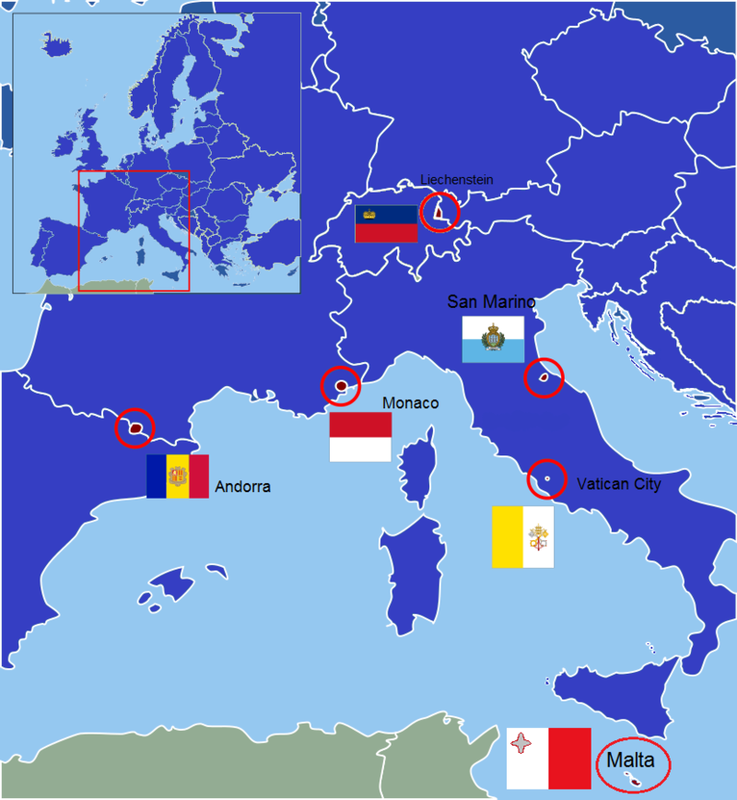 The European microstates or ministates are a set of very small sovereign states in Europe. Andorra, Liechtenstein, Malta, Monaco, San Marino, and the Vatican City are usually included, and are the six smallest states in Europe by area. Four of these states are monarchies (three principalities—Andorra, Liechtenstein, and Monaco—and one papacy, the Vatican City), with all these states tracing their status back to the first millennium or the early second millennium, except for Liechtenstein, created in the 17th century. Microstates are small independent states recognized by larger states, unlike micronations, which are only self-declared and not recognized . . . Some scholars dispute the status of Vatican City as a state, arguing that it does not meet the "traditional criteria of statehood" and that the "special status of the Vatican City is probably best regarded as a means of ensuring that the Pope can freely exercise his spiritual functions, and in this respect is loosely analogous to that of the headquarters of international organisations." It might be strange but I have this fantaisy of living in a small country like it. I can not imagine modern day Catholics defending anything,much less the pope leading the troops into battle. How times have changed,we are in a very different world. I would like to visit the Vatican some day. I've always been curious about them, particularly Malta. I would love to visit one day. "On 17 September 2016, the then presidential candidate Donald Trump tweeted: ‘A nation without borders is not a nation at all. We WILL Make America Safe Again!’ The outcry obscured the fact that Trump was right (in the first half, anyway). Borders determine who’s in and who’s out, who’s a citizen and who’s not, who puts in and who takes from the common pot. If a nation cannot defend its border, it ceases to exist in any meaningful way, both as a going concern and as the agreed-upon myth that it is . . . The trends that are pinching the nation-state are helping the city-state. In a highly connected, quasi-borderless world, cities are centres of commerce, growth, innovation, technology and finance. According to Bruce Katz, Centennial Scholar at the Brookings Institution in Washington, DC, and co-author (with Jeremy Nowak) of the forthcoming book The New Localism: How Cities Can Thrive in the Age of Populism, the hub-like quality of large cities is especially valuable in the modern economy: ‘Innovation happens because of collaboration, and that needs proximity. You need a dense eco-system, and so hyper-connectivity is reinforcing concentration.’ Cities also have demographic weight on their side: for the first time in history, in 2014 the majority of humans live in cities . . .
Clearly, nation-states won’t go down tamely. Carving out a new form of sovereign authority from an existing one is extremely difficult, and is generally frowned upon by the UN. There’s a more prosaic reason too. In 2015, 2.1 million residents of Venice in Italy (89 per cent of those who voted) voted for independence in a non-binding referendum. Residents were annoyed that the city pays $20 billion more in tax than it gets back. But Italy will certainly not let Venice and its $20 billion tax go easily." That's from a website which promotes cosmopolitanism, but I should think the borders of a city-state would be far easier to control than the borders of a large nation. I think that the city states would be too small to defend against larger, more ambitious countries. @OsricPearl wrote: I think that the city states would be too small to defend against larger, more ambitious countries. Yeah. When people say they want see various nations break apart I think they forget what made them in the first place - uniting for security.